I have to admit, I completely forgot about PB Max. Maybe because it wasn't around for very long. But once the words "PB Max" were uploaded to my brain again it all came back. The delicious taste of creamy peanut butter and oats on a square whole grain cookie, then the whole thing dipped in chocolate.....the annoying commercials reminding me that PB didn't stand for "Piggy Banks, or "Polka Band", or "Pink Baboon", or even "Portly Ballerina". It all came back. Oh how I miss you, Max. Is it ok if I call you Max? No? My apologies. So why did the PB Max Go away? 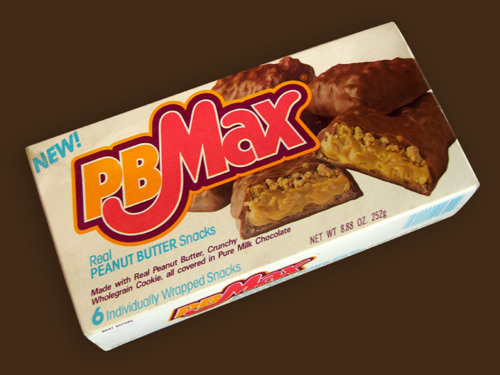 Rumor has it (According to former Mars executive Alfred Poe), that PB Max was discontinued due to the Mars family's distaste for peanut butter, even though in it's short run the candy bar racked up $50 million in sales. Now there is one serious dislike for peanut butter. Maybe Peanut allergies ran in the family and they were just watching out for their own. Or maybe they just wanted me to be standing in the candy aisle one day in the mid 90's, utterly confused, looking like a fool, trying to figure out what the hell happened to my beloved PM Max. Or maybe it was neither of those things. I too seriously LOVED PB Max!! How I miss that candy bar. I can't believe another candy bar company hasn't stolen this recipe and ran with it. Hell, maybe I'll start selling it. $50 Million in sales? I'm down with that! It's true. The Mars boys were raised in England where peanut butter is despised and it rubbed off them. That English upbringing is conversely the reason why the Mars company has for years tried to shove hazelnut concoctions on the public even though Americans generally hate hazelnut. Best candy bar EVER! This stuff was so rich and decadent...just like Reese's but even more substantial. Even had a cat named "PB Max" after the delish candy bahh. I think its demise had to do with the fact that it initially was promoted with two bars per package and then later reduced down to one bar per package for pretty much the same price as you were paying for the two bar package. Fifth avenue did the same thing but somehow managed to last, though now not nearly as popular. When people get used to paying a certain price for something, even though it is a promotional item, and then are asked to pay the same price for half as much, they begin to look for other products. Have to say I compleatly forgot about PB Max until watching Disney Channel cartoon PJ Masks. It jogged my memory to Google it, and found this cool website. These were awesome. Who doesn't like peanut butter? The comments say there was no cookie just cookie pieces. Can someone confirm if there was actually a cookie base or whole grain cookie pieces throughout? I owe my lifelong sobriety to PBMax. When I was a young sailor on a weekend pass, a friend and I purchased two round-trip train tickets into Chicago for the Blues Festival. We had just enough money for the tickets and a couple bottles of Yukon Jack. Over that weekend, we enjoyed live music from blues greats, drank like a couple of idiots, and since we were broke, would have gone hungry. Except for the nice young ladies handing out free samples of something I had never heard of, PBMax candy bars. We lived on those and booze for two days. Needless to say, I have stayed away from booze and PBMax ever since. Looks pretty cool - but what did the PB stand for again? Purple Bananas? I loved PB Max. It had a cookie base that was similar to a graham cracker, thick, creamy peanut butter, topped with cookie pieces, and then covered in chocolate. PB Max had a square shortbread-like oat cookie with indentations, a think layer of rich and REAL peanut butter, and then the oat cookie crumbles all covered in milk chocolate. I vividly recall how generous the amount of peanut butter was, and it was just like getting a spoonful of Jif. The realest peanut butter candy bar ever invented. PS: This isn't an actual online grocery store, so don't email me to ask about buying the products listed. They aren't for sale, and in fact, may only exist in photographs anyway. Enjoy, and please stop in again! From the Candy Aisle: Bonkers!